Ananya’s scholarship has focused on urban transformations in the global South, with particular attention to the making of “world-class” cities and the dispossessions and displacements that are thus wrought. Her books on this topic include City Requiem, Calcutta: Gender and the Politics of Poverty and Worlding Cities: Asian Experiments and the Art of Being Global, the latter co-edited with Aihwa Ong. A separate line of inquiry has been concerned with new regimes of international development, especially those that seek to convert poverty into entrepreneurial capitalism and the economies of the poor into new markets for global finance. Her authored book on this subject, Poverty Capital: Microfinance and the Making of Development, was the recipient of the 2011 Paul Davidoff award, which recognizes urban planning scholarship that advances social justice. A resident of Oakland, CA, for many years, her recent research uncovers how the U.S. “war on poverty” shaped that city and how also it became the terrain of militant politics as well as experiments with community development. This work appears in her new book, Territories of Poverty: Rethinking North and South, co-edited with Emma Shaw Crane. Ananya’s ongoing research examines what she calls the “urban land question”, in India, as well as in globally interconnected nodes across North and South. Her emphasis is on how poor people’s movements challenge evictions and foreclosures, thereby creating political openings for new legal and policy frameworks for the use and management of urban land. Ananya is also one of several scholars seeking to build what can be called critical poverty studies. Building on development studies, this field of inquiry examines the emergence of poverty as a global problem and the various programs, rationalities, technologies, and affects through which this problem comes to be governed around the world. Along with colleagues at the University of California, Berkeley, she has recently completed a book on this subject, titled Encountering Poverty: Thinking and Acting in an Unequal World. 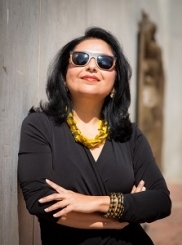 Interested in how academics can speak to public audiences, Ananya has also experimented with digital and social media to produce a series of short videos that provoke questions about poverty, inequality, and poverty action (https://challengeinequality.luskin.ucla.edu/globalpov/). Teaching and mentoring are central to Ananya’s academic life. At the University of California, Berkeley, she received several teaching awards, including the Distinguished Teaching Award, the highest teaching recognition bestowed by the University of California, Berkeley on its faculty; the Distinguished Mentorship Award in recognition of the advising of graduate students; and the Golden Apple Award, the only teaching award conferred by undergraduate students. She is also the recipient of the “California Professor of the Year” award of the Carnegie Foundation for the Advancement of Teaching and the Council for Advancement and Support of Education. In 2011, Ananya received the Excellence in Achievement award of the Cal Alumni Association, a lifetime achievement award which celebrated her contributions to the University of California and public sphere. An active participant in the geography and urban studies community, Ananya currently serves as editor of the International Journal of Urban and Regional Research.